Need to quickly add one or a few contacts to your mobile messaging list? Just follow these instructions to help guide you through the process. 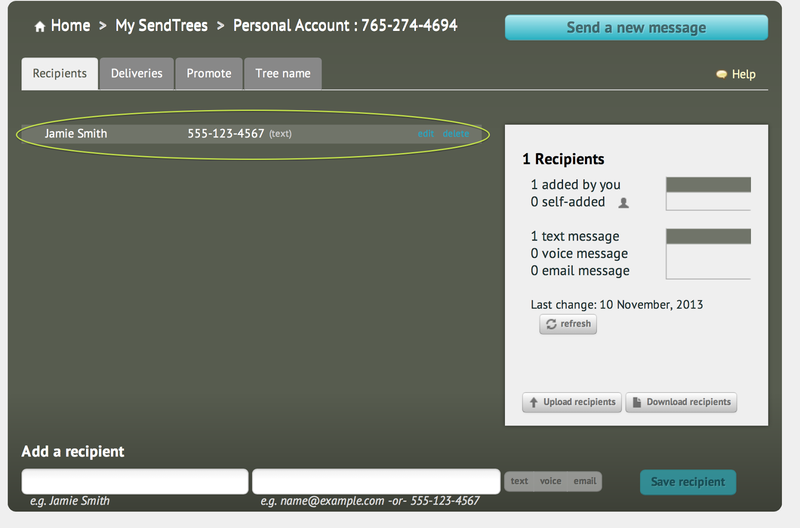 If you’ve got lots of recipients to add you can always upload a pre-existing list with SendTree’s import feature. Just click here for those instructions! Sign in to SendTree and select your SendTree account. Keep in mind that if you have more than one account with SendTree you can select a specific account to add a recipient to. An example of a page with multiple accounts. Scroll to the bottom of the page to locate the “Add a recipient” prompt. Enter the name and number (or email) of your contact. Select if you’d like the individual to receive a text, voicemail, or email message from your organization or business. Finally, select the blue “Save recipient” button and you’re done! The contact will now appear in your recipient list. Congratulations on succesfully adding a contact! Now you can create messages and start communicating with your contacts.